I love hearing success stories from non-traditionally published authors, so it's my pleasure to introduce you to Tony Eldridge, whose novel, The Samson Effect, recently caught the eye of a major Hollywood producer. The circumstances are unusual, to say the least. Readers may peruse the full press release here, but to make a long story short, the Hollywood producer's name also happens to be Tony Eldridge–the factor which made him check out the novel and eventually acquire the film rights. Congratulations, Tony. That's quite a story. Tell us about The Samson Effect. My current book is the action/adventure novel called, The Samson Effect. New York Times bestselling author Clive Cussler called it a “first rate thriller brimming with intrigue and adventure.” It is about a biblical archeologist and an Israeli biblical linguist who are searching for evidence of the substance that gave Samson his great strength. However, there are a couple of enemies they have to avoid who want to find, and use, the substance for their own sinister purposes. In fact, the arch villain in the story is a Palestinian madman who wants to use the substance to create an army of soldiers with superhuman strength to fight a worldwide battle for Islam in the name of Allah. 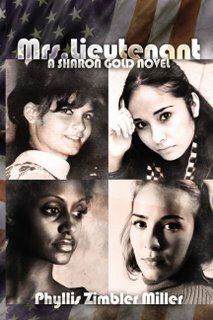 Readers can read an excerpt of The Samson Effect at http://www.samsoneffect.com/excerpt.html. I was a minister for ten years and I still fill the pulpit on occasion. One area of study that fascinated me centered on the stories found in the Old Testament, like the story of Samson. To me, neither Hollywood nor the New York Literary empires could churn out stories that are as intense, action filled and entertaining as the ones described in the Old Testament. Since I am an avid reader of thrillers and action/adventure novels, bringing the love of the Old Testament stories together with the modern adventure stories I love was a natural. I wanted to write The Samson Effect in a way that would not be considered Christian literature, but would appeal to the people who liked fast paced action books with a religious tie-in. I am definitely a stream of consciousness writer. The only planning I do is when I am mowing the yard or exercising. I will often think through the story, the plot or characters. But when I sit and write, I write with free-flow sessions. I did try to outline, but I never stuck with it. Don’t get me wrong. In a sense, there is some outlining that needs to go on. With me, I do a lot of thinking and letting my characters act in my overactive imagination. This is a type of outlining since I will refer back to my imagination and use it as a basis of scenes in the book. It took about three and a half years from the time I wrote the first words of the first draft to the time a perfect bound copy rested in my hands. That included about 3 to 4 months of writing the book, about a year of revisions, and a of couple years to let it sit before I got busy in getting it published. You know, I came into this knowing that negative criticism was a given for authors. I set my mind to view it as a badge of honor. Fortunately, I have yet to experience a bad review or comments (at the time of writing this). I have been in a couple of major market newspapers, many online review sites and I have a few amazon.com reviews, but, I know the negative comments will come. And when they do, I will pull up my favorite authors like Clive Cussler, James Rollins, or James Patterson. If you look at any great writer today, they all have their critics. And that’s normal I guess. We all deserve a way to express our opinions. And the author who one day appeals to every person will be in a very unique and lonely club. I do have one quirk that is somewhat interesting in this modern age. I have to write my first draft in long-hand. I then either type it into my word processor or I speak it in using voice recognition software. But here’s where it gets quirky: I have to use black ink only. I will use blue ink in a crunch, but it puts me in a foul mood until I get my black ink pen back. I have a box of pens with black in my office so I never have an excuse to be in a foul mood. I will often get to a point in a scene where I either can’t come up with the conclusion or everything I try sounds contrived or forced. Times like that I have to go on one of my inspirational mowing sessions or jump on the treadmill. Sometimes I just get in the car and drive, letting my creative juices run their own course. You would be surprised at how many times the “Eureka!” moment comes to me when I give my imagination full liberty to do what it wants to do. But for me, it only works when I am totally alone. You don’t know how many times I came home late because of writer’s block. Luckily, I have a very understanding and supporting wife. Yes. 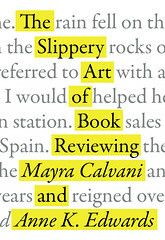 Readers can learn more about The Samson Effect at http://www.samsoneffect.com. They can also keep up with current news, find out about new reviews, and enter contest. 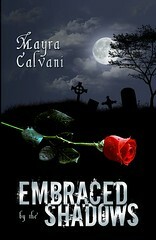 Currently, I have a contest going on where I am naming a character in my next book after the winner of the contest. 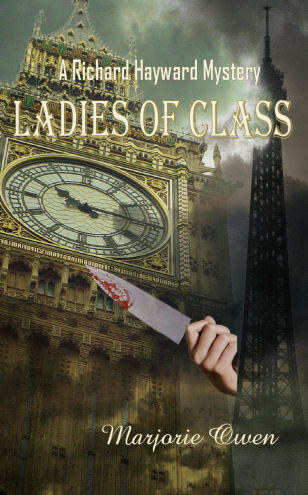 I am writing the next book in the series. The Hollywood producer who acquired the film rights to The Samson Effect has asked me for a synopsis of four books in the series, so hopefully I will be busy writing for a while. I want to thank you for the opportunity to let me share information about me and my book with you. If anyone has any questions for me, they can visit my website and click on the contact tab. The e-mail address goes straight to me. Richard disappeared upstairs to the bathroom, Ella to the kitchen. While she was washing the crocks and tidying generally, a slight frown marred her usually placid face. She was recollecting the recent conversation, dismissed out of hand Richard’s gloomy forebodings. Of course Kate would return sooner or later, but better sooner than later. …So he’d come to Burshill but of course his reputation had preceded him. There was a certain amount of antagonism to overcome – human nature being what it is – but Ella had no doubt he’d cope. In a way, he became a bit more human to his fellows when he broke the bone in his leg, not from some heroic deed but slipping on a patch of hidden ice! She smiled at the thought of his discomfiture over that episode, hung the tea towel up to dry, switched off the kitchen light and prepared for her own exit bed wards. At that moment the telephone bell rang. Ella nearly jumped out of her skin. By official request the phone had been left from the previous owners, so probably this late call was from some friend who didn’t know of the change of an occupier. Curiously she picked it up. A man’s voice asked if she was Mrs. Hayward. “Mrs. Hayward, senior,” she corrected him. Ella was a copper’s widow and a copper’s mother but at this moment the mother came uppermost. “He’s in bed asleep,” she lied. The voice at the other end was polite but firm. Ella felt like telling him to go to hell. She knew she was fighting a losing battle. “Who are you?” she asked crossly. Richard frowned but came down to the phone. Ella was fidgeting about beside him. “Surely you’re not going out now!” she remonstrated. … But before he’d had time to take more than a few sips of the scalding coffee, the police car was at the door. The fog, he noticed with relief, was much less dense. The driver introduced himself and they were off. Sir John Bury lived about ten miles outside the town. Practitioners of Traditional Asian Medicine have used bear gall bladders and bile for 3,000 years. Yet it wasn't until the 1980's that the cruel, intensive 'farming' of bears began. Though there have been positive developments with the Vietnamese government recently, bear farming still takes place in other parts of Asia. It is estimated that at least 12,000 bears are trapped in these inhumane facilities inside tiny cages the size of their bodies and subjected to a lifetime of suffering and pain as their gall bladders are drained on a daily basis. In spite of the fact that there are a large number of natural and synthetic substitutes for bear bile, making bear farming needless, bears continued to be subjected to this inhumane treatment. In this interview, Dena Jones, Program Manager for the World Society for the Protection of Animals (WSPA) US, talks about bear farming, the campaign against it, and what we can do to help these beautiful wild creatures from experiencing a lifetime of suffering. Thank you for taking the time to answer my questions on this important subject, Dena. What is the origin of bear farming? When did this cruel practice begin? Bear gall bladders and bile have been used in Traditional Asian Medicine (TAM) for some 3,000 years. During the 1980s, the practice of extracting bile from bears held captive for this purpose became popular in a number of countries in Asia. Since that time, the marketing of and resulting demand for bile products has led to the introduction of the intensive “farming” of these wild animals. The number of bears on farms has increased dramatically in recent years. At present it is believed that there are approximately 7,000 bears held on farms in China, 1,400 in South Korea and 4,000 in Vietnam, although the actual number could be considerably higher than official figures suggest, particularly in China. What countries are currently involved in this practice? As mentioned, bear farms are known to exist in China, Vietnam and Korea, but some low level of the activity also probably takes place in other Asian countries. While the scope of bear farming is limited to Asia, the killing of bears for their viscera and the commercial trade in bear parts is a global problem. Due to the decreasing number of Asiatic black bears left in the wild, gall for use in TAM now also comes from American black bears, Polar bears, Sun bears and Himalayan brown bears. Bears in North America, for example, are killed illegally and their galls removed and smuggled out of the country for sale in traditional medicine shops in Asia. What is the bile extracted from the bears used for? Bear bile contains an active constituent known as Ursodeoxycholic Acid (UDCA), which on ingestion is believed to reduce fever and inflammation, protect the liver, improve eyesight and break down gallstones. The products of the bear parts trade can be divided into three categories: manufactured bile medicines, farmed bile powder and intact bear gall bladders. Intact bear galls are sold for the highest price. During a 2006 investigation conducted by the World Society for the Protection of Animals (WSPA), a TAM shop in Los Angeles was found to be selling a single gall bladder for $2,800. As a result of the growth of the marketing of bear bile and the bear farming industry in Asia, bear bile is now being added to many non-medicinal products, such as wine and shampoo. Isn’t there a substitute that can be used in place of bile for those who practice traditional Asian medicine? Yes, there are a large number of herbal and synthetic alternatives to the use of bear bile. WSPA has surveyed TAM practitioners asking them about herbs that have the same medicinal properties as bear bile. This has resulted in a list of many different herbs that have the same properties and can be used as alternatives to bear bile. UDCA, the active ingredient in bear bile, can be made synthetically, and it is estimated that 100,000 kg of this substitute is being consumed each year in China, Japan and South Korea, and that global consumption may be double this figure. WSPA actively promotes the use of both herbs and synthetic UDCA to reduce the suffering of bears on bear farms and the poaching of bears from the wild. What exactly happens to the bears in these farms? Extraction of bile from bears differs between countries, although all techniques result in serious animal welfare problems. In China the procedure involves the creation of a tissue duct, or fistula, between the gall bladder and the abdominal wall. Bile is collected by inserting a rod through the fistula, which then drains the contents of the gall bladder. To prevent the fistula from closing up the wound must be constantly re-opened, usually once or twice a day. Bears have been seen with inflamed and bleeding wounds, open incisions for bile extraction and swellings in the abdominal area. The most common method of bile collection in Vietnam involves the use of ultrasound equipment to locate the gall bladder. Once located a long syringe is inserted into the bear’s abdomen to puncture the gall bladder. The bile is then siphoned off into a collecting jar. In Korea the extraction of bile from live bears is illegal. Instead farmers breed bears and slaughter them in front of their customers to prove the authenticity of the gall bladder. Many bears live in cages measuring around 1 meter wide, 1 meter high and 2 meters long. Bears have been observed to be wounded and scarred from rubbing or hitting themselves against the bars of their tiny metal cages, where they cannot stand up or easily turn around. Prior to being used for bile extraction, bear cubs in many farms are trained to perform tricks such as tightrope walking for the amusement of visitors to the bear farms. At three years of age they are operated on to be farmed for their bile. Is bear farming, and the commercial trade in bear bile, legal? 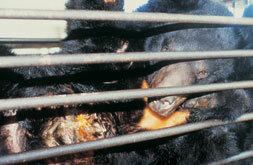 Bear farming is illegal in Vietnam but remains legal in China and South Korea. Products containing bear bile can be legally sold within these countries. However, international commercial trade from bear farms is illegal under the Convention on International Trade in Endangered Species (CITES). CITES is an international agreement between governments aimed at closely monitoring and controlling international trade in endangered plants and animals. The legal status of the trade in bear parts within a country depends on the wildlife laws of that particular nation. For example, in the U.S. interstate trade in illegally taken wildlife or products from wildlife is prohibited, and 34 states ban the sale of bear parts within the state. Unfortunately, poaching of bears continues, in part due to the inconsistency of state laws and the fact that 11 states allow the sale and 5 states have no laws related to trade in bear parts. How does the practice of bear farming affect bears in the wild – in Asia and elsewhere around the world? All eight species of bears on our planet are regulated by CITES because they are either threatened with extinction or may be threatened if trade is not restricted. Five of the species are listed on Appendix I of the CITES agreement, which prohibits all international commercial trade in these animals or in products from them. With 75% of the world’s bear species already threatened with extinction, preventive measures are needed to protect remaining bears from a similar fate. The trade in bear parts puts pressure on small, isolated bear populations in particular. One of the most common arguments made by the bear farming industry is that farming bears reduces pressures on wild populations, thereby aiding their conservation. It is argued that if the demand for bear bile is met by farmed bears there will be no need to hunt or poach wild bears. However, there is no evidence to support this claim of beneficial protection, largely due to an almost complete lack of information on wild Asian bear populations, particularly in China. What is WSPA doing to end bear farming? WSPA is pursuing a variety of approaches to reduce both the supply and demand for bear bile around the world. Through investigations WSPA has helped to expose the cruelty of bear farming and the illegal trade in bear parts. 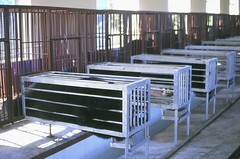 WSPA conducted international undercover surveys of the illegal trade of bear bile products in 2000, and again in 2006. This research documented the extent of the trade in several western and Asian countries including the U.S., Canada, Taiwan, Japan, Singapore, Korea, Australia and New Zealand. The organization has lobbied governments to take a strong stand against the bear bile trade and bear farming and also promoted the use of herbal alternatives to bear bile. Celebrities, like comedic actor Jackie Chan, have been enlisted to bring the anti-bear farming message to audiences around the world. Have there been any significant developments in the campaign? In 2005 WSPA reached a landmark agreement with the Vietnamese Ministry of Agriculture and Rural Development to establish a national task force to phase out bear farms in Vietnam. The agreement outlines the government plans for three main stages: 1) registering and micro chipping of all bears in captivity, 2) stopping the breeding of bears on bear farms and 3) enforcing the ban on the taking of bears from the wild. WSPA has also funded the development of a bear parts detection kit to assist in efforts to enforce laws against the commercial trade in bears. The kits are currently being tested in Canada, Australia and the Netherlands, and plans are underway to trial the kits in Asia. Use of the kits will allow government officials to monitor the presence of bear bile in medicinal and cosmetic products and will help in determining the trade routes used to distribute bear bile products. What can people do to stop bear farming in Asia? Anyone using alternative medicine should ensure that they are not consuming products that contain bear bile (usually but not always identified by the word “ursus” on the ingredient list). Citizens or ex-patriots of Vietnam, Korea and China should communicate to government officials their desire that bear farming be phased out as soon as possible in these countries. Citizens of other countries can also help by asking their federal officials to encourage the Chinese and Korean governments to end bear farming. What can teachers and parents do to teach children about these important animal welfare issues? One of the best ways to address the mistreatment of animals is through improving human understanding of and attitudes towards them. One way to accomplish this is by encouraging the inclusion of humane subjects in educational programs. WSPA works across the education spectrum, from school age children to university students studying veterinary medicine and other sciences. “IN AWE” is the WSPA program for 5 to 16-year-old school children, teachers, teacher trainers and curriculum developers. Working with governments, teachers and some of its member societies, WSPA has helped embed animal welfare into the school curriculum of several countries in Africa, Asia and Latin America. Information about WSPA’s humane education program is available at http://animal-education.org. An adjunct professor at the University of Central Arkansas and Arkansas State University, Dan Skelton is the author of three published works, Out of Innocence, The Human Element, and Boojum. His fourth novel, Renascence, which he just finished writing recently, blends elements of futurism and religion. Skelton was kind enough to take time out of his busy schedule to answer my questions. I'm a native Arkansawyer (yes, yes, Arkansan, too) born in Conway. Educated at St. Joseph School and then at Arkansas State Teachers College; after that I earned an MA+30 in English at the University of Arkansas in Fayetteville and, ultimately, earned a doctorate in Higher Education from the University of Mississippi, Oxford. I have taught in high schools in Fort Smith, Springdale, and Morrilton with a brief stint with fourth graders at St. Joseph. From 1967 until 2002 I taught at Southern State College, which became Southern Arkansas University, where I worked my way through the ranks to full professor and Chair of the Department of Theater/Mass Communication. I have one child, a daughter, who makes me endlessly happy and two beautiful, brilliant, and talented grandchildren, a girl and a boy. Probably at the age of four or five, when I first learned to read, but definitely by the time I got into the Freddy, the Talking Pig, series. Voracious. I read everything and had no serious fixation on any one genre. My latest effort is still in manuscript. I finished the first draft last night (6-21-08) at around midnight. It is called Renascence and concerns a teenage girl named Skye and her best friend, Bombsie. Both are mall rats and drug heads. They live in a futuristic society in which belief in God is considered a mental illness worthy of a "mind wipe" and the "elderly" are "transitioned" in their mid sixties. Through the efforts of Skye's grandmother, Grandee Purr, the girl's life is transformed. The other books I have written tend toward the gritty and dark in content and language. I began to think that any positive message was being lost because readers, perhaps, could not see the forest for all the ugly trees, so I decided to write a book that was strong, pure, and straightforward. That I have done. I never create an outline. 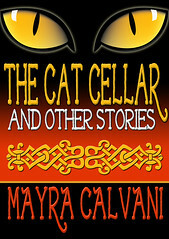 By the time I write, I have given a considerable amount of time to the story–beginning to end. If I know where and how it will end, I can get there. I trust my creative impulse to lead me. Some elements are transformed and rearranged in the writing because, in that mysterious process, forces do supersede the rational mind, always for the better in my estimation. No, a minimal amount, unless you count a lifetime of experience and observation research. I wanted readers to appreciate the fact that God the Father, the Son, and the Holy Spirit constantly seek to participate in our lives, that all of us caught in a mundane quotidian have the opportunity to cooperate with the supernatural and bring forth good out of apparently wasted and barren lives. Maybe just to present God's love, God's presence, God's availability, to establish that we humans are the body of Christ: arms, legs, eyes, etc., and that if good is going to be done for those in need, it will come through people cooperating with the spirit of God. Mostly teenage girls and women from as young as the middle grades, possibly, all the way up to include college students. Actually, I believe more mature women will like it also because the point of view shifts about between the girls and the older women. I'm hoping there will be no age barriers. Who can really say? I hope they will learn that in the words of an old hymn, "there is no other way than to trust and obey," or that, as Whitman would have it, "The keelson of creation is love." Certainly I synthesize things out of my experiences and so I suppose that puts me in the Hemingway camp as opposed to someone like Arthur C. Clarke. Some of my best thinking comes when I am taking walks or doing some task that allows me to function with my mind "out of gear," so to speak. As I automatically walk or drive or work at a chore, my thoughts can range about freely. When they do, they provide me an image, a line, a concept, or they connect up notions I have idly considered before. Next thing you know, hunks and slabs of story line come poking through to the surface. So far, she has been generous. I am the one who resists, if I am in a funk over some real or imagined stress or failure in the material world. When that happens, I can block out communication for quite a while. She is patient with me, waiting until she finds a chink in my armor of obstinacy, whereupon she rushes in with some enticing nugget of possibility. Eight months to twelve or fourteen months. Word processor–My! How that invention has freed me–and silence. Scenes of passion. It is so easy to overwrite. Francis Irby Gwaltney, Arkansas novelist and one of my early mentors, cautioned me about always trying to "rip your reader's guts out." I understood his point but realize that I am often still guilty of that error. I do edit as I go along; however, there remains a great deal to do in that department even after the first draft has been completed. I've had some negative comments from "strangers," though nothing that was too scathing. Truthfully, it hurts, but I try to keep a level head; I pray about it, and, ultimately, try to learn from it. If that sounds "saintly," it really isn't. There's agony enough in the process, believe me. Hmmm! Nothing really, although I have been given moments of pause upon considering the possibility of giving scandal or leading some infirm mind and will astray. Love, duty, hope, responsibility. I think the culture we live in has neglected those, cultivating instead Lust, a sense of separation, despair, and irresponsibility. I think so. At this point, I have three published novels and four yet to be published manuscripts so, if I'm not disciplined, I am productive. I don't plan my writing sessions in advance other than anticipating a weekend or a holiday period as a great opportunity. I function as a soccer grandpa; I help clean the house and work on the lawn, mind the kids as needed and run the usual assortment of errands. My writing, of necessity, comes after those needs are seen to, which means some late night work and snatched times on weekends. Night owl, unless I have to teach the next day. Yes. My agent is Mindy Phillips Lawrence of MPL Creative Resources; she is also my publicist. My experience in searching for an agent parallels that of searching for a publisher–in a word, frustrating. Yes. I constantly punctuate by inserting three periods of ellipses, which vexes Mindy somewhat. Other than that, I'm sure I am a model of writing purity and saintliness. My opinion is use them if you must. Some people need instant feedback, but, of course, what they want is instant praise. If that bolsters one, fine. If the comments grow snide or biting, check out of that place immediately. As a young fellow, I rushed with writing hot in hand to teacher, parents, librarians, etc, asking "What do you think?" Mostly they were kind and helpful but, at some point, I came to realize that there was no ultimate arbitration, merely opinions and I lost the need to have myself validated. Now, I do what I do; if you like it, fine; if you don't, well, this is what I do. Yes, but almost always because I have allowed a case of Poor Little Old Me to overcome my industry. "Oh, I'm not good. I'll never amount to anything. No one's ever going to publish me." Etc,etc. What normally unleashes me is reading or going back to work again. Sometimes, it is possible that a writer simply needs a small vacation in order for the internal computer to reset. Keeping the dialogue believable, interesting and yet moving the scene along. Vexation! Frustration! Hair Tearing! Try to tell yourself it's not personal and keep on plugging away. I don't know this for a fact but I'm betting if you sell yourself well, your books will move off the shelves quicker. Oh, so many . . . Norman and Norris Mailer, Donna Tartt, Robert McCammon, Preston & Childs, Koontz, Anne Easter Smith, the fellow who wrote SARUM (Edward Rutherfurd), Thomas Wolfe, Tom Wolfe, Faulkner, Walker Percy, Reynolds Price, etc. Find your own voice; stop trying to be Wolfe or Faulkner or anyone else. Yes. About all you have to do is Google Dr. Dan Skelton. Having just finished Renascence, except for edits, I am in a free wheeling state for the moment. I have a strong interest in the horror/supernatural and have been toying with dealing with Chupacabra or some other crypto-zoological creature. Well, it's certainly not money. Probably having someone who is a total stranger find a way to tell me that what I wrote deeply affected them. Only that I remain hard at work and hope that those of you who recognize my name from this source will give me a look-see the next time opportunity arises. Do you have a dream, yet are afraid to take the necessary steps to make it a reality? Do you have misgivings about taking that first step toward achieving your goal? Do you often fantasize about leaving your job or starting your own business, but freeze at the possible consequences? If you answered yes to some of these questions, you might consider getting a copy of this book. The author, an executive coach and motivational expert, takes you step by step into the process of planning to reach your goals, from recognizing the pivot points in your life, to understanding what triggers your fears, to stepping out of your comfort zone, to cultivate the calm mindset necessary to overcome any challenge. The book is divided into 7 days (or chapters): Dare and Defy, Breakdown and Breakthrough, Center and Connect, Imagine and Invent, Plan and Prepare, Focus and Flow, and Gulp and Go. In the tradition of such works as The Artist’s Way and Feel the Fear and Do It Anyway, Gulp! is an inspiring and uplifting book. I found the prose engaging and a pleasure to read. Goddard’s style is warm, straight forward, and friendly. There are ‘wisdom’ quotes spread throughout, exercises at the end of each chapter, and many tips and practical advice. Though the program is meant for a week, it may also be followed on a weekly basis, thus finishing the program in 7 weeks. 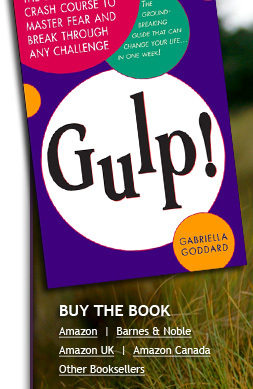 Though one could argue that the ideas and advice found in this book are also found in similar books on the same subject, I believe Gulp! is a fine addition to any self-help shelf. If you’re an animal advocate and would like to help further, you can send a message to Amazon’s CEO (using the link above) urging him to stop selling material that promotes illegal animal fighting. They had their whole lives to look forward to – if only their husbands could survive Vietnam. In the spring of 1970 – right after the Kent State National Guard shootings and President Nixon’s two-month incursion into Cambodia – four newly married young women come together at Ft. Knox, Kentucky, when their husbands go on active duty as officers in the U.S. Army. Former Lieutenant Phyllis Zimbler Miller is the co-author of the Jewish holiday book Seasons for Celebration and the author of a success guide for teens. In this interview, Miller talks about her latest book, Mrs. Lieutenant, for which she's touring the blogopshere this month of June.